It will spawn 1 after every 1 move. 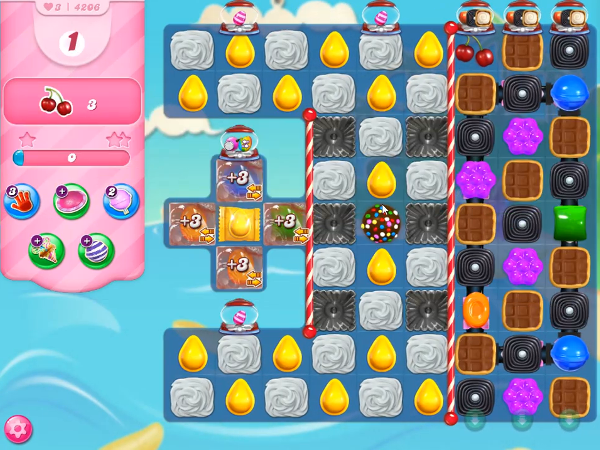 If there are fewer than 2 candy bombs on screen, then the board spawns up to 2 when possible. If there are fewer than 7 liquorice swirls on screen, then the board spawns up to 7 when possible. If there are fewer than 7 waffles on screen, then the board spawns up to 7 three-layered waffles when possible. The board spawns at least 1 extra moves candy when possible. If there are fewer than 1 ingredients on the screen, then the board spawns up to 1 ingredient when possible. The maximum number of ingredients on the board is 1. First combine color bomb with yellow candy to break icing blockers, marmalade and to collect extra moves candies to get extra moves. Striped candies will fall from candy cannon, use them to break waffles, liquorice swirls, remaining icing blockers and to collect more extra moves candies. Then make special candies and combine special candies to more waffles, liquorice swirls and to bring down all ingredients to the bottom to complete the level.